You are being told lies. In this video, you’ll hear from Professor Tim Ball of the Department of Climatology at the University of Winnipeg, Professor Nir Shaviv of the Institute of Physics at the University of Jerusalem, Lord Nigel Lawson of Blaby, Professor Ian Clark of the Department of Earth Sciences at the University of Ottawa, climate forecaster Dr Piers Corbyn, Professor John Christy of the IPCC, Professor Philip Stott of the Department of Biogeography at the University of London, Professor Paul Reiter of the IPCC and the Pasteur Institute in France, Professor Richard Lindzen from the IPCC and MIT, Professor Patrick Michaels of the Department of Environmental Sciences at the University of Virginia, economist and author James Shikwati, former New Scientist editor Nigel Calder, NASA Weather Satellite Team Leader Dr. Roy Spencer and even Greenpeace co-founder Patrick Moore. The video points out how we have been force-fed a diet of AGW pap for years, and it’s a wonder that a solid majority of the public doesn’t believe this farce. As one scene from the BBC shows, we see the area in London near Parliament flooded from the Thames River, along with Trafalgar Square, and as someone who once lived in England and walked these areas a number of times, I can testify that it can be a little disconcerting to see places you know appearing to be flooded, even though you know it’s just special effects. As you see in this video, even members of the IPCC point out that the Intergovernmental Panel on Climate Change (a UN group) is a political organization, that the number of people in the group is inflated, and that a number of members do not agree with the hysterical findings published by the leaders of the group. Professor Shaviv points out that evidence indicates the earth once had three times as much or more CO2 in the atmosphere as we see today, yet these could not be blamed on human activity. 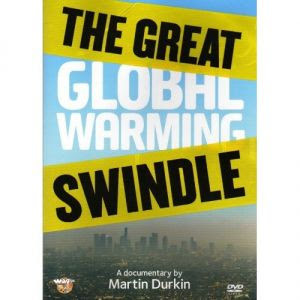 Indeed, as the film points out, the earth has been considerably warmer in the last 1,000 years or so, and has been coming out of a “Little Ice Age” a few hundred years ago–all of this prior to SUVs, power plants or any industrial human activity. Why does NASA perpetuate this bunk, especially when a great deal of their own data points to natural causes of climate change? As Dr. Spencer points out, “Climate scientists need there to be a problem in order to get funding.” True believers in AGW like to claim that those of us who realize the theory doesn’t pass the smell test are simply minions of a powerful profit-driven oil industry. But the inconvenient truth they ignore is that there is even more money–free, easy, taxpayer money–flowing to the green movement based on the perpetuation of this fantasy. Their motives aren’t nearly so squeaky-clean as they would have you think. As the narrator summarizes so well of the film, “This is a story of how a theory about climate turned into a political ideology.” Over the next several days, I will post a new part of this important film at Dakota Voice. I hope you will come back for all the parts, if you have the courage to face the truth about this massive swindle. Read about parts 2 through 8 here. Previous Previous post: Green Tea Party!